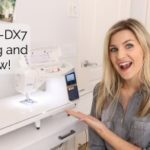 Last Friday I did a live video on my facebook page talking about my best tips for sewing machine maintenance and what the numbers on sewing machine needles mean and the different types out there! Many of the viewers asked for a blog post that they could refer to for the future, so here is the information I shared with some photos, so that it can be used to refer back to as necessary! Here are some of the needles in my collection. 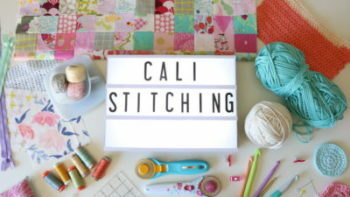 This will vary a lot based on the type of sewing you do! Your sewing machine manual is a great resource. 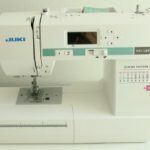 In addition to using the right needles, keeping your sewing machine in good shape is a good way to get consistent results and avoid headaches when sewing. Have your machine serviced every few years (depending on how often you sew) and clean out the lint regularly. 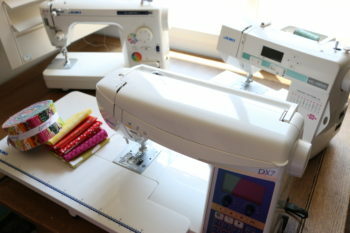 If you machine requires oil, follow the manual – but my juki likes oil every 6-8 hours of sewing. 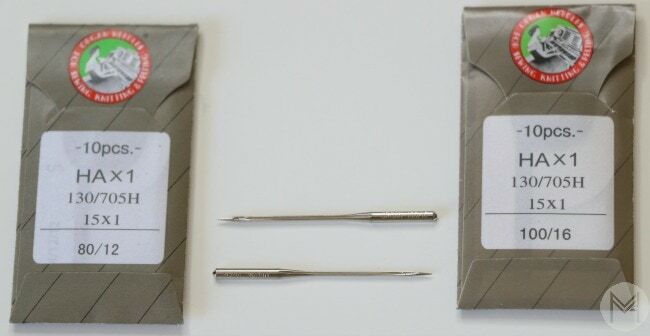 My number 1 tip for sewing machine needle troubleshooting is … Replace your needle every new project! They are very inexpensive, this is not the place to pinch pennies. Also, if you ever have sewing machine tension issues, replace your needle and the first step of troubleshooting. 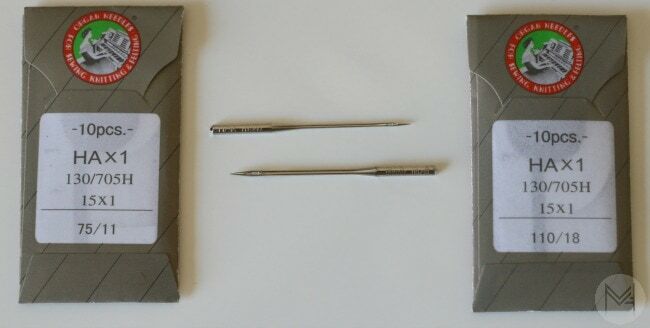 Here are some of the universal needles that I have and what you could use them for. The top needle is a 75/11 and you can see how much thinner it is than the 110/18. A 75/11 needle would be used for lighter weight fabrics like voile or organza, a 60/8 is the smallest you can get, for sheer fabrics so that gives you an idea of what it might be for. 130/705H means that it is for a home sewing machine (versus industrial) and has the flat shank. 110/18 would be for very heavy sewing like leather or denim. The top needle in this next photo is 80/12 and is great for cotton lawns and light cottons. This is very similar to the 75/11 needle. The 100/16 needle is good for corduroy, lighter denim, outdoor fabrics and suiting. The most common needle that I use is the 90/14. Here are 2 versions, the top is a topstitch needle which has a longer eye (you can see that well in the 2nd photo) but they are the same size otherwise. 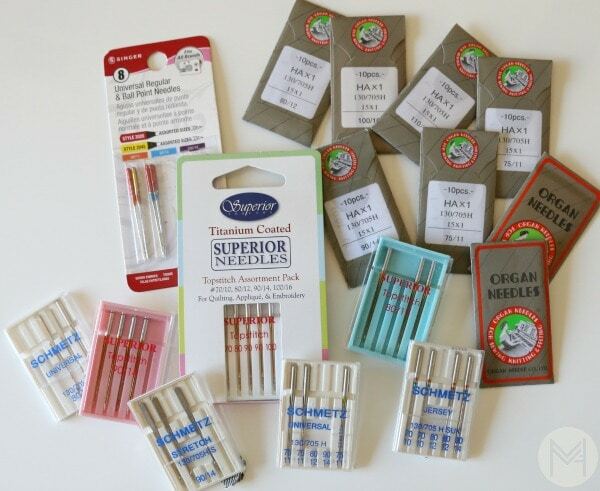 Many in the sewing and quilting community like the topstitch needles because it reduces friction causing less thread breaks. I have personally not noticed a huge difference, but it is something to try for yourself and see. Both of these needles have worked very well for me. 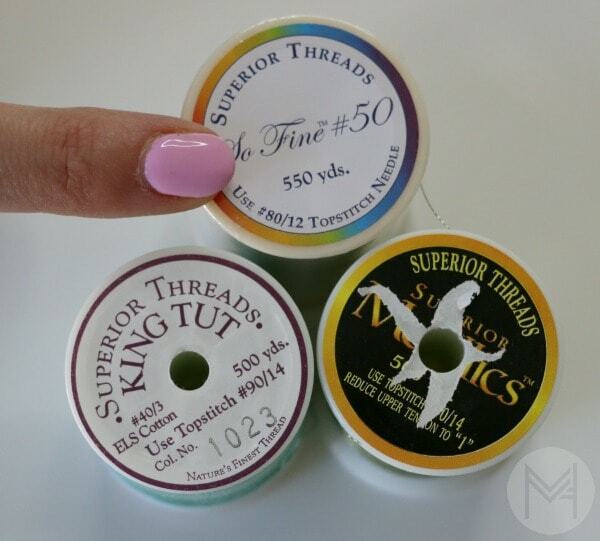 I love that superior threads puts the recommended needle right on their spool of thread. It’s very handy. Aurifil is the thread I mostly use, and they recommend an 80/12 needle size for the 50wt (orange spool), 90/14 for the 28 wt (grey spool) and a 90/14 topstitch needle for the 12 wt when machine quilting or 100/12 for machine embroidery. If there is a specific thread you like, you can check their website for their preferred needle size. I mostly use cotton thread, so thinner polyester thread may need something specific. I mostly sewing with quilting cottons on quilting projects and craft sewing which means I need a universal needle most of the time. 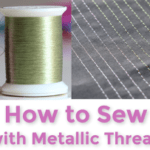 If you are sewing with different types of material, here is a good guide. Universal – most sewing, especially with woven fabrics. Use the different sizes for different thicknesses of fabrics. Let me know if you have any additional questions and I can add the info to this post! *This is not a sponsored post. It does contain affiliate links. Thank you for the support in that way! What size needle when making a t-shirt guilt? And thread would you use? Thanks for all the useful information. I can look back when ever I need to know the correct needle for the job.